Today was the last day of our service trip to San Juan/McCallan Texas and I am exhausted! It was another blessed morning and another great breakfast. A large part of this trip is to allow the members of our group to experience the people of the Rio Grande Valley and today did not disappoint. We gathered together at the Church of Juan Diego. We gathered again with Maryknoll Srs. Ann and Pat, along with members of the church community. We prayed, talked and ate. Each component special in its own way. The prayer was about community and an open heart. The talk was from the heart. The food warmed our hearts. We broke up into small groups to talk to each other and learn about each other. The Q&A started pretty much like any other - "What's your name? Are you married? Kids?" - but quickly evolved into deeper questions and thoughtful answers. "How long have you lived here?" is not as simple a question as you may think! The topic for my little group quickly turned to the church and the faith of faith life of the members of the community. Much like I have come to think of the members of our community as 'family' it was evident that the members of San Juan Diego were a family as well. Mario and I spent time with two men who have been members of the parish for 50 years and who have worked to build up the local church. They are doing an amazing job and are very proud of the programs that they are part of. They take their job of passing on their faith traditions seriously but with a joyful heart. We learned that their children are working as educators and in school administration. We learned that they are proud of their Mexican heritage but are also proud to be in America. We learned that the members of this Catholic community want to grow their community. After our discussion time, we had the opportunity to break bread (or tortillas) as a group - enjoying another bountiful spread of various tacos, salads, and fruits (including delicious avocados) made by many of the ladies who we spent time with. After lunch we headed over to view the construction of their new church. We had been hearing about their new church but I was not prepared for what I encountered when I arrived. I was, quite frankly, expecting a church larger than the existing one we met in - but nothing grand. I was mistaken. The new structure is immense. White stucco, tiled floors, a balcony and the most beautiful stained glass. For such a poor community where are they getting the money? With a closer look (and some explanation) it is even more remarkable. Almost all of the furnishings and all of the art were donated. The stained glass windows came mostly from a church that closed in Boston, MA. The pews (and there are hundreds lined and stacked up) are of all vintages, shapes and sizes. The architect has volunteered all his time and manual labor has been provided by the community. The church is a marvel - but it is only partially completed. There are issues with water pressure - the pressure that is coming into the building is not sufficient for the automated sprinkler systems. Work is almost at a standstill until a solution can be reached. One solution is to install a water pump that will provide the necessary water pressure. The hugs that we all received (and gave) as we said our goodbyes were at the level that I share for close family and friends - and it felt not only good but right. Our afternoon was spent at the Catholic Charities of the Rio Grande Valley Respite Center where we now felt knowledgeable enough to jump in and take charge - which was good since they were understaffed today. I realized something as the day went on - even with a short staff and some eager but inexperienced volunteers, each and every person that was cared for felt like they mattered. No just mattered though - that they are loved. The little kids (ranging from a few weeks old and up) played, laughed, had their hair braided, played catch, colored and were, well, they were little kids. Their worries were gone for a little while as our group played with them. The adults had time to shower and eat, shop in the clothes closet and relax for a moment as they prepare for the next phase of their journey. The day drew to a close with a wonderful dinner to celebrate our time together as a team. As this trip winds down I will continue to reflect on all I learned and hope to continue to blog about this experience and all that comes from it. But for now, I am fulfilled. A view from the rafters. Sr. Norma addresses us at Hidalgo Park, an area split by a border wall. Day three of our journey. It truly is a whirlwind adventure. The day starts early with morning mass at the Basilica of Our Lady of San Juan. It's a short walk from the hotel to the Basilica and it's the coolest and most beautiful time of the day. Today is the Feast of Saint Lawrence - he of "Turn me over, I'm done on this side" fame and the patron saint of comedians and cooks (look it up if you don't get the reference, it's worth the read). After a great breakfast (again Chorizo tacos) and many cups of coffee, we meet up with Sr. Norma Pimentel, the Executive Director of Catholic Charities of the Rio Grande Valley, a Sister of the Missionaries of Jesus and the Mother Teresa of McCallan, TX. We have been hearing about Sr. Norma as we prepared for the trip as well as from everyone we've met here. It's almost hard for me to believe that anyone can live up to the build-up she's received but she certainly does. There is nothing brash or sensational about her, in fact, her demeanor is the epitome of calm. Jen described her this way. “I was impressed by this sense of freedom that Sr. Norma had. She is living exactly as she should live and moves through what she needs to live effortlessly. Whether it's spending time with volunteers, immigrants or on a conference call looking for funding to support her work." Mary Beth interviews Sr. Norma on the trolley as we journey to the US/Mexico border. Our time with Sr. Norma was incredibly informative. She isn't happy with the political climate - but that's true of every administration since 2001. "Some administrations are blatant while others have provided lip-service to the plight of immigrants but none have addressed the root causes." I had a chance to ask her what she would say the root cause is that makes people feel they must uproot themselves and walk hundreds (if not thousands) of miles in search of a better life. "Violence. Gang violence." 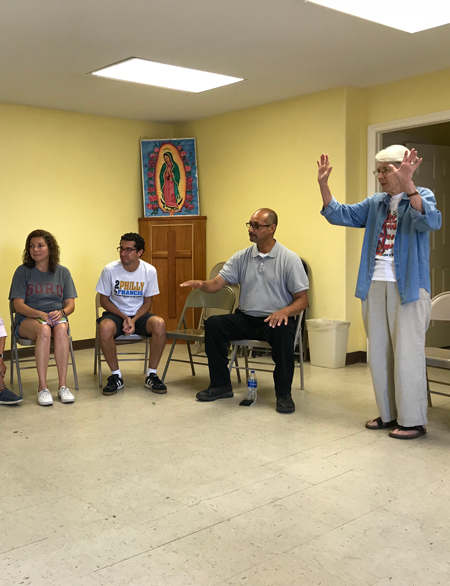 Just three weeks ago Sr. Norma and Catholic Charities of RGV were instrumental in reuniting hundreds of children who were separated from their parents. "All these families who were separated we gave them cell phones - over 500 phones - so we can keep in contact with them and they have someone they can contact...I get calls from them." A Border Patrol vehicle travels down the road past the wall. This is approximately one mile from the actual border with Mexico. 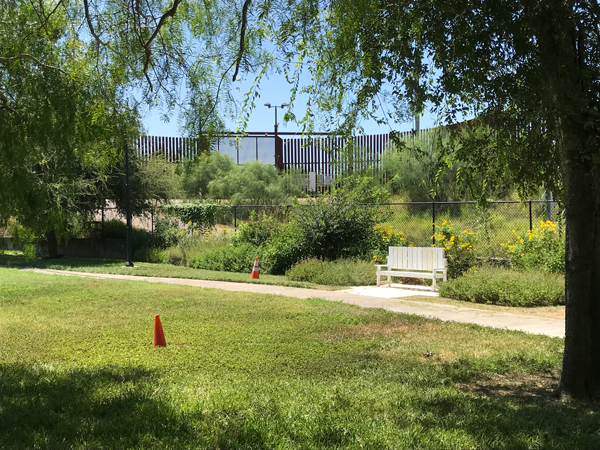 We visited a section of the existing wall that cuts through Hidalgo Park - a beautiful park that has been around for over a hundred years and whose landscape has been changed (hopefully not forever) by the presence of a foreboding steel wall. About a mile beyond the wall is the actual border with Mexico - the Rio Grande River. Where we visited the river it looks calm and peaceful but Sr. Norma explained that looks are deceiving. The currents below the surface are much faster and cause many fatalities each year. There is a special project that is dedicated to giving name to the men and women who have died while trying to cross the river. Sr. Norma surveys the Rio Grande with Mexico on the far side. As Sr. Norma speaks to us, it is evident where she gets her strength - her faith is exposed for all to see. Even as we break bread with her at a local taco eatery "Palanque Taco" it is also evident what the impact she has on the community. She is treated with reverence by the people - some because she has worked with them but most because of who she is and what she is doing to raise up all people and help them embrace their dignity. As Patrick put it "A stranger approached Sr. Norma just to thank her. For a stranger to take the time to approach and thank, hug and cry shows a lot of the magnitude and impact that Sr. Norma has in her community. It shows how much of a mover of mountains she is." When it is time to part from Sr. Norma so we can spend the rest of the day volunteering at the Respite Center she runs she leaves us feeling blessed. She is also a good sport as most of us take 'selfies' in the fast food eatery. I haven't walked the road with many saints in my life but I can say with confidence that Sr. Norma is doing the work of a saint and is living out the example of Matthew 25: 35-40 for everyone she comes in contact with. The work at the Respite Center was as chaotic, stressful and joyful as the prior days but understanding the flow of the day allowed us to serve with purpose and be 'intentional' in our service. I'll end with just a few quick stories from our team's experiences at the Respite Center today. Each is a blog post unto itself but I'll keep it very brief. Mary Beth worked in the 'Clothes Closet' where each individual is provided new undergarments and some donated clothes and shoes. As she put it, "a surprise was working in the clothes closet. The numbers were astounding. I found it important that these young boys and girls and their parents look good and match. It goes back to human dignity - you can’t go around with mismatched clothes!" Laurie and Jose commented on the plight of the immigrant. “The people trying to cross are coming from many different countries. They don’t see justice or injustice…they may pass through many countries but when they get to our border they don’t understand," said Laurie. Jose added “These people are fleeing to the 'land of the free'. Think about that." It's been an honor sharing these experiences with you and I hope that I've been able to do justice to the blessed experiences I've had.